Nothing is quite so satisfying as cutting into a fresh avocado, peeling back the skin, and finding a perfect specimen inside; smooth and creamy, spotless green that is just soft enough to work with but firm enough to hold its shape when you slice it. While eating one may feel utterly indulgent, avocados are actually very good for you. Yes, they are high in fat, but it’s the good kind that helps to lower your cholesterol, and adding them to your diet offers all kind of benefits for your health. They are a good source of vitamin K, dietary fiber, potassium, folic acid, vitamin B6, vitamin C, and copper. The following recipe is one of my all-time favorites: a chimichurri sauce that tastes just like the one I remember, combined with avocados for an amazing alternative to guacamole. I found it in Vegetarian Times magazine a few years back . 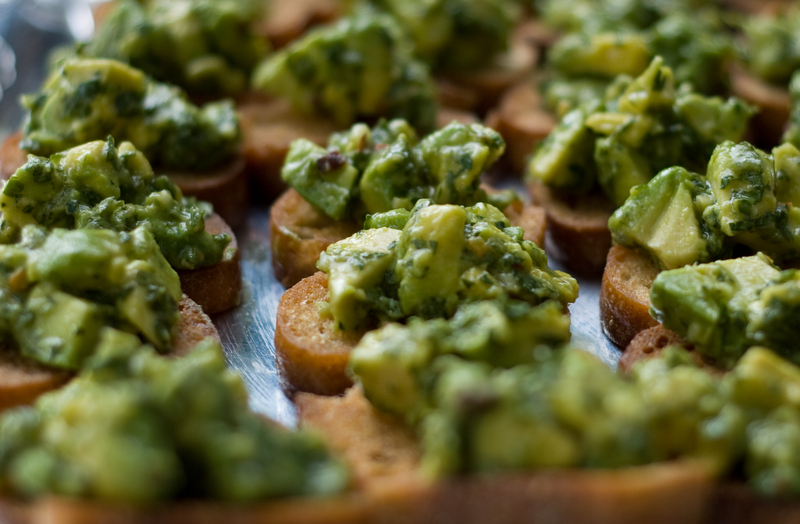 Super easy to make, it’s my “go-to” whenever I need to bring an appetizer to a party, and people always want the recipe. Without adding the avocado, this is an intensely-flavored chimichurri that goes beautifully with fish and meats. I’m planning to try it with some salmon this week. Honestly, it’s got the kind of flavor that makes you close your eyes and sigh…oh yeah…this is good. This is definitely a gem and I am so very glad to have been the recipient of it on several occassions! I should make it for this weekend – Lisa loves it! I remember when you made this and posted on NM. I still need to try this one. Thanks for posting it! Carla, let me know what you think!